The drawdown of U.S. troops in Afghanistan begins this year, but remaining soldiers overseas may get smartphones. 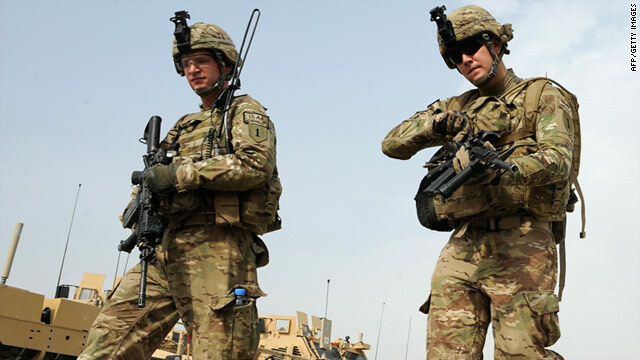 (CNN) -- For U.S. Army troops, smartphones could become requisite field gear, along with boots, guns and ammunition. The Army is wrapping up a six-week program to test the viability of using touchscreen phones and tablets in combat. The pilot program began on June 6 within the White Sands and Fort Bliss training areas in New Mexico and Texas. This dry run has proved so encouraging that Army officials say they expect the first wave of smartphone-equipped soldiers could be shipped overseas later this year. Certain members of brigades are already assigned tactical radios. The phones wouldn't replace radios, but they would be distributed more widely and would ideally operate in conjunction with older equipment, officials said. The infantry is using smartphones to text message updates about their surroundings, send pictures with an attached GPS location, pull up maps, and quickly fill out regular reports. "When they have a problem or need to submit a report, they default to the texting," said Michael McCarthy, an Army director for the program. "These young soldiers grew up with this technology. They're very familiar with it. They're very comfortable with it." Systems that tap a phone's camera and GPS to overlay information on an image of nearby surroundings, also called "augmented reality," is also in development, officials said. In the trials, troops have collectively evaluated more than 300 Android, iPhone and Windows Phone units, McCarthy said. They are also kicking the tires on tablets from Apple, Dell and Hewlett-Packard, he said. Separately, another Army division is testing phones running a specialized version of Google's open-source Android software, officials say. The prototype device is called the Joint Battle Command-Platform Handheld. "We're looking at an assortment of devices," McCarthy said. "All the phones we've tested are pretty good." A few devices have proved problematic, though. One popular phone from Samsung Electronics failed to connect to cellular networks and had bugs in its Android operating system, McCarthy said. So Sprint Nextel exchanged it for a different Samsung model, he said. The Army group initially had some trouble testing the iPhone in the desert grounds, due to a problem many longtime owners of the popular Apple device know all too well. "AT&T didn't provide service there," McCarthy said. Later, they were able to run the iPhone through its paces with the rest. "IPhone and Android have been very well received," said Ed Mazzanti, the Army director who has shepherded the mobile-device program. Mazzanti expects the Army will anoint two mobile operating systems for official use. That way, they can minimize software development needs while still offering variety, which could defend against cyberattacks targeted at a specific type of software platform. Army software engineers have developed a way for applications to be ported between the two platforms with minimal effort, officials said. Other apps are being coded as mobile-optimized Web pages, they said. A spokeswoman for Google, which makes Android, declined to comment on the company's dealings with individual organizations. An Apple spokeswoman also declined to comment. Soldiers can operate the devices' touchscreens using special off-the-shelf gloves. Don't expect to see sergeants at Costco loading up shopping carts with electronics. But Army officials say that buying commercially available technology, rather than investing in research and production, is more economical. "It's a lot cheaper for the Army to buy stuff that's already been developed than to develop it on our own," McCarthy said. Many of the products sold at Best Buy are more advanced than the tools currently in the Army's pipeline. A smartphone, as texting fiends know, is not just a phone, Mazzanti said. "It's a computer; it's a display unit; it's a video-out unit," he said. "Since it is a computer-based utility in a 7-ounce package, we just started realizing there was a vast amount of potential." But obstacles remain before phones can be doled out to combat troops. The phones' software and their transmissions aren't fully secured. "Today, we don't have the level of encryption that we would need to take (a phone) overseas and fully integrate it into our mission-command systems," Mazzanti said. Still, "there could be some limited deployments even this year, tied to tactical radios that supply the encryption that's needed." In tandem with the smartphone and tablet program, the Army also is testing gear that allows operators to deploy a makeshift cell network. The "cell tower in a suitcase," which creates a limited-range wireless network, would be used when service is unreliable or likely to attract unwanted listeners.